This was most definitely a season of eggplant and tomatoes in our garden. We had an over abundance of each; more than enough to share, eat on a regular basis and preserve. 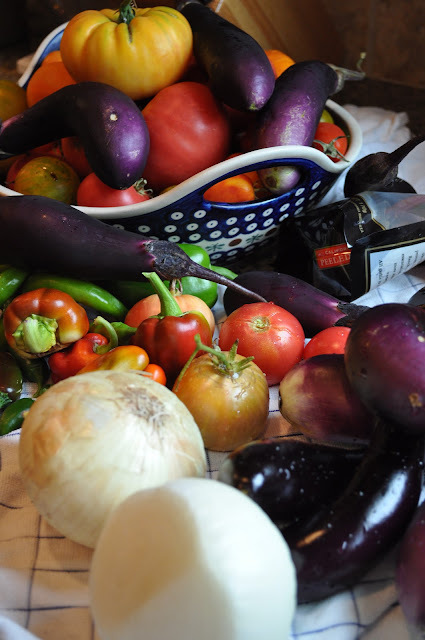 So with the last harvest of eggplant, tomatoes and peppers I added some onions, garlic and herbs to make a huge pot of ratatouille pasta sauce. It made enough to fill three freezer bags with servings for 6 people in each bag. This should taste really good on a cool fall evening when I have been sewing all day and need a quick dinner. What do you keep on hand for a quick dinner after a long day of sewing? After freezing then I used my Food Saver to seal the bags and pop them into the freezer. I love a hearty beef stew - made with a stout beer replacing some of the water or beef broth - to come home to after work. Love to pop it all in the crock pot before heading out to work and come home to a house smelling of garlic & onion & stew veggies. Add a quick batch of biscuits and it's dinner! I keep a....husband on hand to do my cooking for me! I don't really care what he cooks as long as I don't have to do it! Your veggies look amazing! Whatever type of pasta sauce I make I try to make extra for freezing. Back up meals in the freezer just make life so much easier, but making a larger batch of sauce doesn't take much more time at all. When it has to be really quick and not get too many complaints then here it's either a Thai chicken curry or Chicken Tikka Masala. I love to have a casserole in the AGA all day though, so that at dinner time I can just take it out of the oven and we're ready to roll! Oh I wish I had some of your harvest, I love aubergines! Yum. Love rata...ratatouille..however you spell it..but haven`t made it in years. Must remedy that!